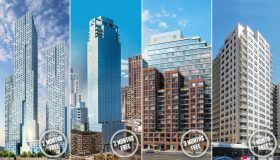 EŌS, the mixed-use tower in Midtown West that 6sqft knighted as the shortest skyscraper in the city, is approaching its construction finish line and after a decade in the making, its 300 rental units are coming online. Countering our superlative, the fully launched website leads with an image of a bath-robed woman perched high above the city looking to the east – the building is named after the Greek winged goddess of the dawn afterall. 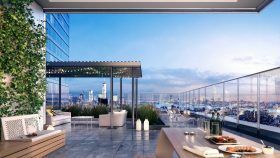 The site also publishes new renderings of apartment interiors, some of the building’s many amenities, and its far-reaching views across the city. 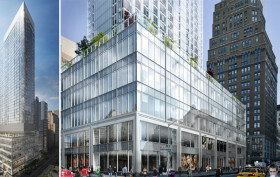 The 500-foot-tall sleek glass slab was designed by COOKFOX Architects and developed by the Durst Organization. Though quite anonymous from the outside, across its 47 stories are an array of uses that include 122,000 square feet of commercial space that Nike is reportedly anchoring, 70,000 square feet of retail, and 375 residential units above (20 percent of which are designated as affordable). 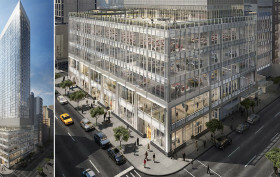 The affordable housing lottery for the Durst Organization‘s nearly finished rental tower EŌS at 855 Sixth Avenue launches today, according to the NYC HPD. 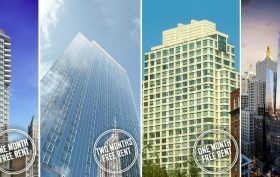 One year ago, 6sqft reported on the 42-story structure’s topping out, which at exactly 500 feet makes it officially tied as the shortest skyscraper in the city. Now, with full leasing slated to begin this spring, the application process for the 75 newly constructed, below-market rate apartments set aside for low-income residents is open. 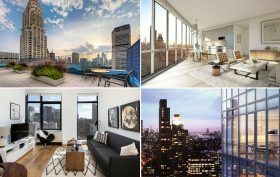 Rents in the Midtown West tower will range from $566/month studios to $930/month two-bedroom units. While unremarkable in design and imperceptible in the city’s skyline, the building’s small claim to fame may be that its 152-meter (slightly under 500 feet) height is sometimes regarded as the benchmark figure for defining a skyscraper. Therefore, statistically, 855 Sixth could be considered the shortest skyscraper in New York. Huzzah!